There are lots of home improvement stores with do-it-yourself solutions, but if you want your ceiling fans installed right the first time, Central Virginia customers choose Shogun Services. With thousands of ceiling fans and light fixtures to choose from, you can trust our team of experts to help you make the best design and functional decision for your home or business. Ceiling fans are a staple of any room in your home and can be quite complicated to get installed. Making sure you choose a compatible model that works with your in-home wiring can be difficult for the inexperienced, and Shogun Services can work with you every step of the way to make sure you make the right choice. 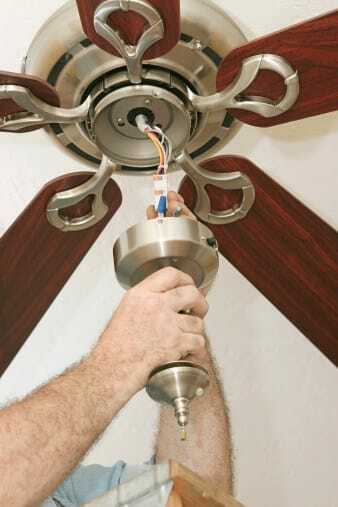 We can also repair your existing ceiling fan if it is giving you trouble. While you may be tempted to fix that rattling or banging in your existing fan, remember that these are electrical devices that could lead to dangerous situations if not handled by a professional. There are also specifications that your ceiling fan needs to meet in order to pass a business or home inspection, and Shogun Services has the knowledge to make sure your existing model or new model meet those standards. We will make sure to follow any manufacturer instructions, and make sure that the model meets all of the building and relevant electrical codes. Another reason to upgrade your existing ceiling fans is that like all modern appliances, they are build and designed for optimal energy efficiency. Shogun Services can help you pick out a model that reduces your A/C usage and helps reduce your overall energy bill.